‘Tis the season for cranberries at all our local markets. ‘Tis also the season for South Asian Indian expats to feel like complete non-entities, because during Thanksgiving all references to ‘Indians’ in America means native Americans. Pilgrims and Indians, Indian corn pudding, Indian harvest feast, and so on. You guys know that Columbus didn’t really find us, right? While he was knocking around off the coast of America, letters of introduction to Indian emperors in his pocket, we were about to be overrun by the Mughals. Mr. Columbus was nowhere near. Luckily we fared better with the Mughals than the ‘other’ Indians did with Columbus and his descendants. In any case, ’tis also the season to not be a curmudgeon, and instead, be thankful; and indeed I am thankful for all the bounty of the American continent. Where would we, the Desi Indians be, without the potato, the tomato, the chili…all first harvested here. Can you imagine Indian cuisine without any of those? And corn — without corn, no makki di roti, sarson da saag? Thank you for opening the floodgates to this bounty, Mr. Columbus. For the food. For the feasts. And more importantly, for not finding us. Now here is an American crop that us Indians should take up, given our fondness for sour foods. The European settlers of America learned about cranberries from the tribes that lived around New England. They were used in a number of ways. As fruit; beaten into cakes with meat; the leaves were used for tea; as a natural dye; as a laxative or for treating injuries and fever. 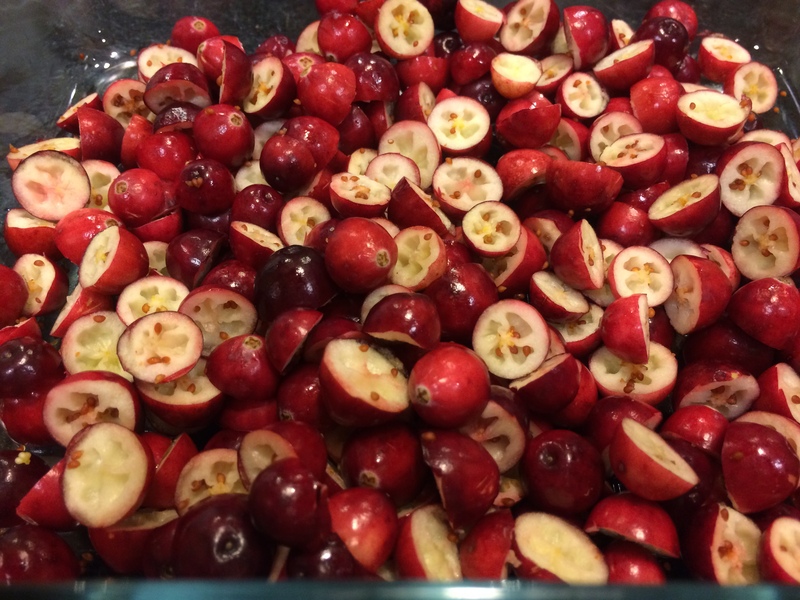 However, cranberries really took off among the Europeans only when cheap sweeteners became available, when the sourness of cranberries could be turned into the sweet-tartness of cranberry sauce and be used as a condiment with meat. Now I love cranberry sauce, and I am about to make some with wine today. But, I think it is a pity that this is the only way they get eaten. 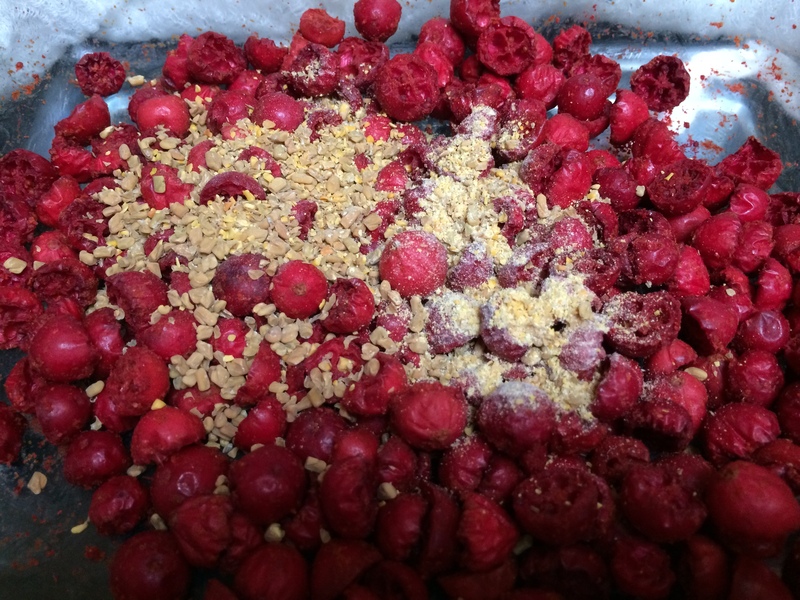 Someday perhaps I will try grinding the berries with some meat, the way the native Americans did. And, cranberry leaf tea, anyone? 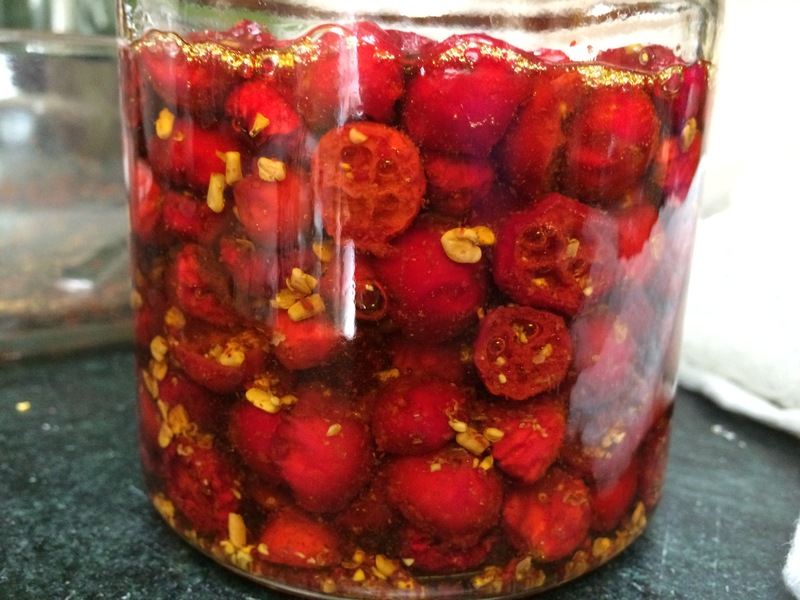 The sourness of cranberries means that it comes with its own natural preservative, so putting it in a pickle is a no-brainer. I like the sourness so much that I did not add any sugar. I made this pickle in the classic (‘real’) Indian style, with mustard oil. First, cut them in half and mix in salt and leave in a flat layer to dehydrate and ‘cook’. Next, put in a jar with other spices and cover with oil. 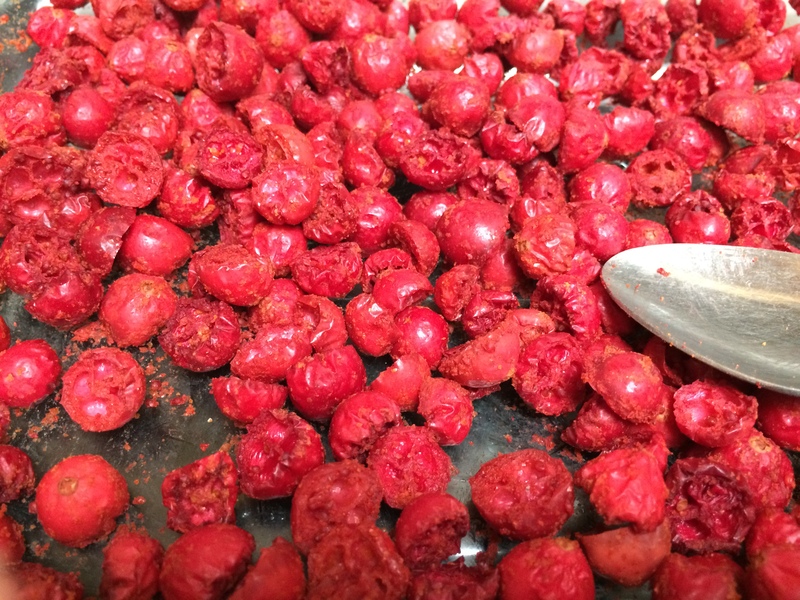 Make sure the cranberries are completely dry and cut each in half through the equator. 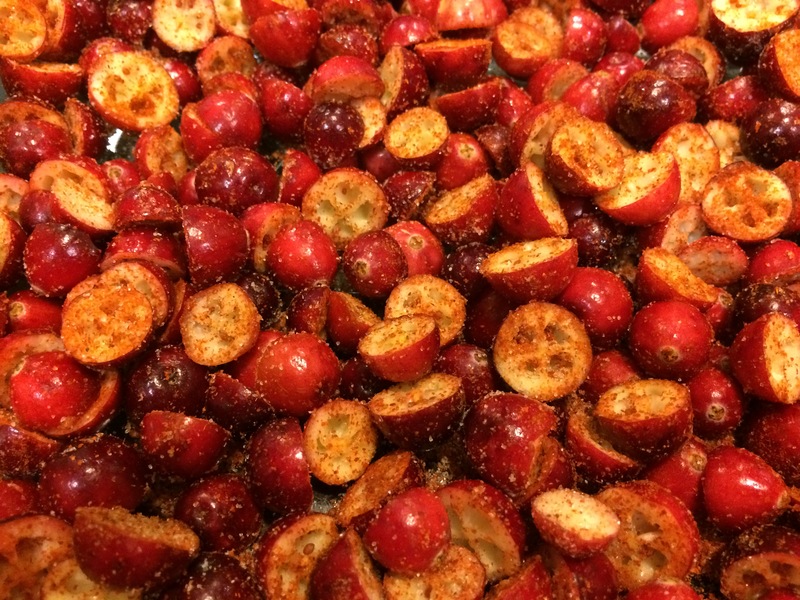 Toss them with the salt and chili powder. Lay them out in a glass or other non-reactive tray in a flattish layer, and cover with cheesecloth. If you get sun part of the day, leave them out in the sun. Each day or two, give them a toss with a clean spoon. Over the days the salt will draw out the moisture and the sun and air will dry it. After three to seven days, they will look dehydrated and shriveled as in the picture above. Break the fenugreek seeds in a mortar and pestle or in a clean coffee grinder. 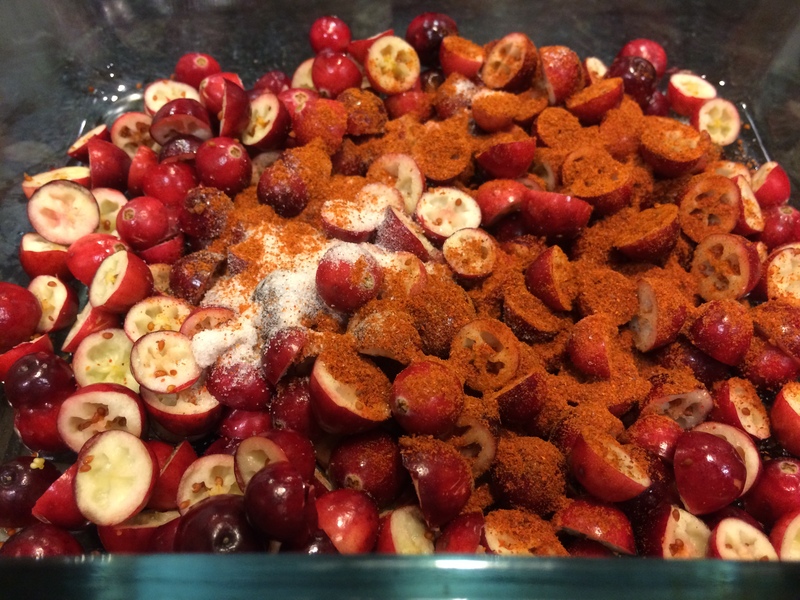 Mix them in with the cranberries. 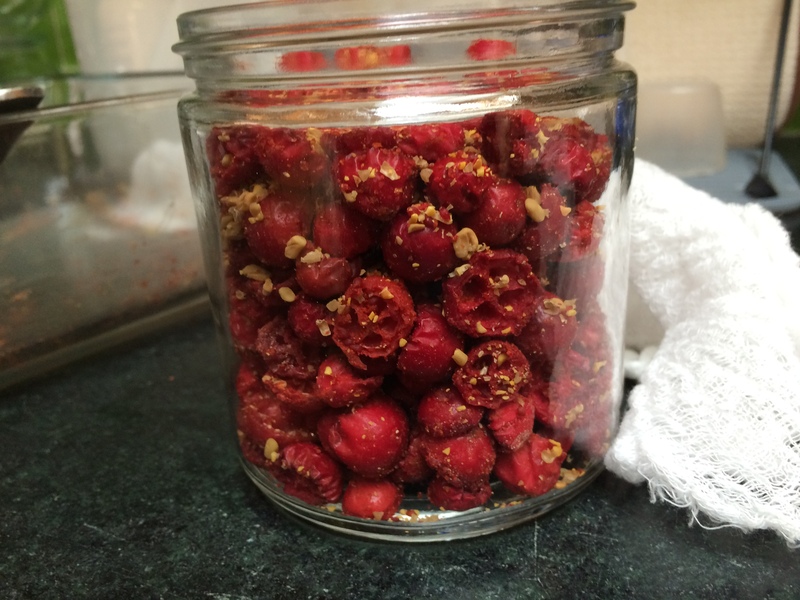 Empty out the cranberries into a clean non-reactive jar. Pour raw mustard oil over them, shaking once in a while in order to remove bubbles, until the oil comes up to the top. Cover and enjoy. You do not need to refrigerate this. As for how long it will last, well, a few weeks certainly, but if they go bad I will update this post.